RIT/NTID has received $1 million from the National Institute of General Medical Sciences to develop a Scientists-In-Training Program for Deaf and Hard-of-Hearing Undergraduates. The National Institute of General Medical Sciences has awarded a grant to Rochester Institute of Technology that is expected to provide $1.025 million in funding over five years to develop a Scientists-In-Training Program for Deaf and Hard-of-Hearing Undergraduates. The award is funded through the Research Initiative for Scientific Enhancement (RISE) program, which is designed to increase the number of underrepresented students who enter Ph.D. programs in the biomedical and behavioral sciences. The establishment of the RIT-RISE program is a groundbreaking achievement because it is the first RISE program to specifically serve deaf and hard-of-hearing students. The RIT-RISE program consists of two components: one is open to the entire university and a second offers additional support to selected RIT-RISE Scholars. The RIT-RISE program will offer a suite of scientific enrichment workshops, presentations, and activities that are tailored to the needs of deaf and hard-of-hearing scientists and open to the entire university. These events are expected to attract students who, for example, wish to enrich their research skills, stay abreast of hot topics in biomedical and behavioral fields, sharpen their presentation skills, or get help applying to graduate schools. RIT-RISE will also provide faculty workshops to share best practices for promoting effective communication between hearing and deaf researchers in the lab. 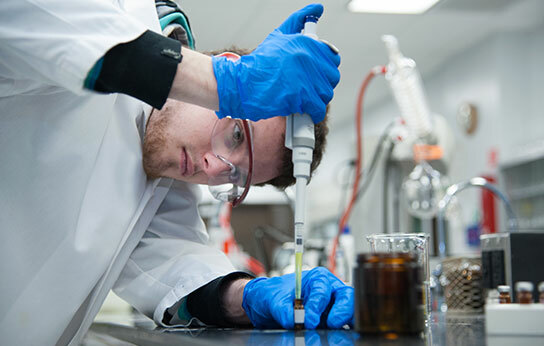 Selected RISE scholars will also receive intensive training and wage support for working in research laboratories with RIT researchers and, eventually, in the laboratory of a mentor from another institution. The RIT-RISE leadership team will help match supported scholars with participating research mentors in their fields of interest. Scholars will also attend local and national conferences, present papers and posters, and publish or co-publish their work. Dr. Scott Smith, a deaf medical doctor and health scientist, will lead this program assisted by Paul Craig, a hearing chemistry professor and the head of the School of Chemistry and Material Science, and Vincent Samar, a hearing cognitive science professor with many years of experience working with deaf and hard-of-hearing students. In addition, more than 40 deaf and hearing members of the RIT faculty have volunteered to serve as science mentors, and 15 deaf and hearing external mentors have already been identified for the summer research experiences that will take place after scholars complete their junior year. RISE scholars will be selected from deaf and hard-of-hearing students in the following baccalaureate programs: biochemistry, bioinformatics, biology, biomedical engineering, biomedical sciences, biotechnology and molecular bioscience, chemistry, computing and information technologies, computer science, computing security, game design and development, human-centered computing, new media interactive development, psychology, and web and mobile computing. The National Technical Institute for the Deaf is leading the RIT-RISE cross-college partnership that includes the College of Science, College of Health Science and Technology, College of Liberal Arts, Golisano College of Computing and Information Sciences, and the Kate Gleason College of Engineering. The impetus for the RIT-RISE program emerged from the National Task Force on Health Care Careers for the Deaf and Hard-of-Hearing Community, a partnership of RIT, Gallaudet University, University of Rochester Medical Center, and Rochester General Health System to examine the potential for deaf and hard-of-hearing people to assume their rightful place in the rapidly growing health care field. The Task Force Final Report (http://www.rit.edu/ntid/healthcare/task-force-report) introduced the concept of establishing Rochester, N.Y. as a National Hub of Excellence and Innovation for Deaf and Hard-of-Hearing Healthcare Professionals and Scientists. Smith, RIT-RISE program director, also leads the Health Care Implementation Committee, which supported the development of the RIT-RISE proposal to fulfill the Task Force recommendation of creating an educational and training pipeline for deaf and hard-of-hearing students to gain access to health care careers. The RIT-RISE program expands the Rochester training pipeline for deaf and hard-of-hearing scientists by connecting undergraduate research training with preexisting NTID-supported Explore Your Future and Health Care Career Exploration camps for high school students, the Rochester Bridges to the Doctorate Program for graduate students, and the Rochester Postdoctoral Partnership Program for postdoctoral fellows.